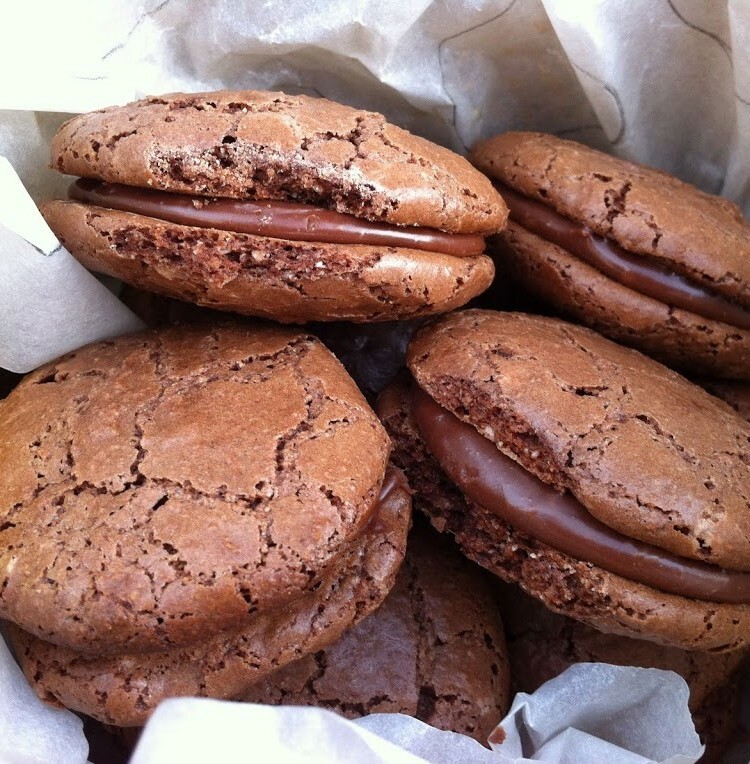 With two left over egg whites from making ice-cream and a Forever Nigella entry to submit over at Maison Cupcake, chocolate macaroons were my indulgence of choice. Sarah of Maison Cupcake has changed the rules, maybe as a new year’s treat and we can now make whatever Nigella recipe we like – hooray! After my last attempt at macaroons, which were delicious but exceedingly faffy, I thought I wouldn’t bother with the piping fiasco this time and just spoon the mixture straight onto the baking trays. Admittedly my first attempt gave a slightly more uniform result, but the difference was marginal and saved me a whole heap of time and mess. Inspired by the herb flavourings for truffles in my newest book Crazy Water Pickled Lemons, I added a couple of things that were not mentioned in the Nigella recipe, namely star anise and rosemary. Whisked two egg whites until nearly stiff. Added 12g cardamom sugar (caster) and whisked until completely stiff. Sifted in 12g cocoa, 65g ground almonds, 125g icing sugar and a pinch of star anise. Folded the sifted ingredients into the egg whites as gently as I could. Spooned teaspoonfuls (22) onto a baking tray lined with baking paper. Left for 20 minutes – to form a skin apparently which presumably is meant to eradicate cracking! Baked at 180C for 12 minutes. Removed from the tray with a spatula and as most of them had merged together whilst baking, cut them apart. Melted 75g milk chocolate (G&B 37% cook’s chocolate) in a pan over hot water with 5 tbsp double cream, 20g unsalted butter and a sprig of rosemary. Stirred until all was melted and smooth. Removed from heat and fished out the rosemary. Beat this with a spoon until it was thick enough to spread. As my kitchen was colder than the fridge, this didn’t take very long. Used generous teaspoonfuls to sandwich the macaroons together ending up with 11 fairly substantial biscuits. Leaving the macaroons out to form a skin didn’t work, just like the last time. My macaroons came out exceedingly cracked. That’s OK, I like the cracked homemade look. However, they were just as delicious as I remember them. Crunchy on the outside and chewy in the middle. The presence of the star anise and rosemary were subtle, but noticeable and added a certain hint of sophistication and exoticism to the proceedings. CT went off on one of his streams of consciousness and identified the taste of China and correctly described the taste as being like China meets the Med. It’s a marvel, he said with what you can do with an egg – the perfect food. At least that’s what I think he said – his mouth was full at the time. Next time I make macaroons, I will stick to the spoon method as it is infinitely preferable to messing around with a piping bag and for incompetents like me, there is no discernible difference in result. Dom, I’m impressed you tried them that many times. As you’ve probably gathered by now, I don’t get on with faffy! Try again and go for the home made crackley look – perhaps we can start a new trend. Ohh! How much would I love to bite into these crunchy, yet delicately soft and oh-so-chocolately macaroons! They are such fiddly things- I often lack the patience. And such lovely added extra flavours Choclette! They look fabulous. I would be sorely tempted to eat way too many! Oh just noticed your recipe index. Looking good! Yes, thanks so much for the instructions. I think it’s going to take me a very long time to index all my recipes, but I’m really pleased to have it there. I can’t be bothered with “macaron” – they seem to be so much fuss! But I do like them when other people make them! Bah, my new motto is forget macaron and go for macaroon 😉 Mind you I’ve never had a perfectly made French macaron, I might change my mind if I had! Gloria thank you, you are very kind. Oh Roz, that sounds fun. You’ll come back being able to bake perfect macaroons and put the rest of us to shame! Thank you Karen – perfect is music to my ears, even though I don’t believe a word of it 😉 You’ve certainly had a very busy time of it recently and I’m amazed how much you’ve still managed to achieve. Thanks to you and Jac for my recipe index – long way to go to get it all indexed though. They look great, and I particularly like the look of the filling – it’s very enticing the way it’s peeping out! Thank you C, I was hoping that cheeky filling would appeal. They look fantastic – I think you might have cured me of my macaroon fear!!! BVG – forget perfect shiny tops, go for the home made look and tuck in with gusto, they are so delicious. I love macaroons, and these look so very delicious, I’ll have to have a go again, I’m with the Brownieville Girl – macaroon phobia now cured…. Ha ha, thank you Liz. I’m starting to feel as though the tide has turned against the perfectly formed French macarons – maybe!!! I have never made macarons even though I am sorely tempted for the same reasons as you…too much faffing around plus I absolutely HATE cleaning out piping bags, so have never piped a fancy cupcake either! I love these cracked crisp topped macarons with a gooey middle and your photo is a winner! Oh Laura, good to hear I’m not the only one that doesn’t like faffing around with piping bags. Thank you for saying nice things about my macaroons. Celia, they are so good and if you’re not after the French polished look, they are very easy too. But I know how adept you are in the kitchen so it wouldn’t surprise me in the least if you produce the most perfect macaroons imaginable. I keep seeing two egg whites every time I open my freezer and wondering what to do with them. I’ve only tried macaroons once but I think it’s time I tried again! Indeed Corina, this is a perfect recipe for two egg whites. Good luck and let me know how you get on. Thank you Sheelagh. Indeed, it seems many people are put of making macaroons because of the current trend for polished French ones. These taste so very good and are so very easy if you don’t use a piping bag. A great adaptation of the recipe Choclette. They look ace. It’s good to know that it’s possible to make macaroons without piping and drawing annoying little circles. It’s one of the reasons I completely avoid them, too much faffing!! These look delicious with their cracked tops. I looks lovely just spooned on! One of the reasons I refrained form making macarons was because of the hassle of piping them, but now I know you don’t have to! Ooh they look lovely. My only attempt so far to make them was rubbish. I need to try again. Oh do give them a go again, they taste so so good. I rather like the cracked tops – they look like they’d crunch nicely when you bite into them! Excellent, thank you CC, you know how to make a girl feel good. And yes they were lovely and crunchy on the outside. If I made those I would need to eat the lot. Great work. Yes Maggie, you have spotted the flaw. We did eat them rather quickly, but CT helped me – honest! Those look amazing! Chocolate indulgence 🙂 Yumm! They look amazing I so want to be able to make them but me and macs do not seem to agree! They made me cry with sheer frustration last time – so perhaps I will try the spoon method as they always taste OK they just don’t look great. Cakeboule, give up on making perfect macarons and make damn tasty macaroons instead. Fantastic! This is music to my ears. I only make macaroons (don’t seem to have the time to try macarons) so this, I feel is a revelation. Thank you for sharing this recipe. I will be trying it very soon. Thank you Charlotte, you are always so generous in your commenting. Gluten free has got to be a bonus too! I am still yet to try macaroons (other than the coconut variety), they seem too difficult! But these look great!! Lottie, these really aren’t any more difficult than coconut macaroons if you ignore the piping bag! You had me worried there Kate with all that coquetting! Indeed, faffing about taking unnecessary steps and creating loads of washing up is generally not the way I like to spend my time. I love the look of these. Something for the expert to bake I fear ! Oh wow. Looks so delicious!! !